Although it was destroyed by ISIS earlier this year, Syria's sacred Temple of Bel is getting a second chance at life thanks to an innovative 3-D imaging initiative. Next year, 3-D printed reconstructions of the temple's Arch of Triumph will be on display in New York City's Times Square and London's Trafalgar Square as part of UNESCO World Heritage Week. 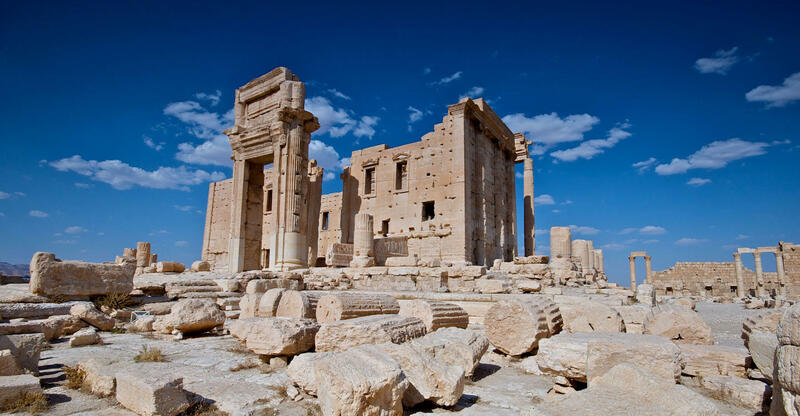 Over the past several months, the Institute for Digital Archaeology (IDA) has quietly deployed a small army of nearly 5,000 amateur photographers armed with 3-D cameras to culturally significant sites in combat zones throughout the Middle East and Africa. Each volunteer discreetly captures high-quality scans of the culturally significant sites, which are compiled into the open-access Million Image Database, a partnership between IDA, UNESCO, Oxford University and others. "The images will be used for research, heritage appreciation, educational programs and 3D replication - including full-scale 3D replication using proprietary cement-based 3D printing technique," the project's website explains. Unfortunately, the Temple of Bel was destroyed before the 3-D imaging project got underway. The IDA, however, has successfully created similar three-dimensional "approximations" of the site by stitching together thousands of two-dimensional photographs, The Guardian reports. Over the next two years, the organization plans to produce several similar exhibitions that have yet to be announced in detail. "While there are those who seek to encourage us to forget the past - to forget the shared history that unites us - we are dedicated to ensuring that the visual reminders that keep that history alive remain a part of the human experience," the IDA adds.